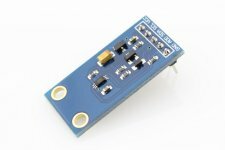 This is a BH1750FVI light intensity sensor module with built-in a 16 bit AD converter generating digital signal. The data from this module is light intensity in lx (lux meter). It communicate with micro-controller board through I2C bus.